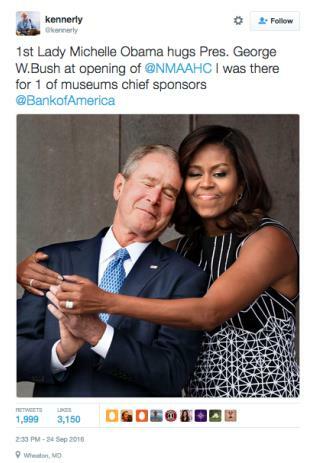 (Newser) – A reunion of "two unlikely friends" happened Saturday during the dedication of DC's National Museum of African American History and Culture, per CNN—and the photo of Michelle Obama's embrace of George W. Bush has now become a "powerful image … for the ages," notes Quartz. CNN notes that the two have become "increasingly chummy" throughout President Obama's tenure, often sitting next to each other at events and even holding hands at a July memorial service for the slain Dallas police officers. George W. Bush, like his worthless dad and brother are RINOs through and through. They talk the talk but never have been able to walk the talk. There is good history on the Bushes and the Obamas, particularly Pres. They are not adversaries in any way. Bush supports Obama because his nihilist policies have been even more strenuously enforced. The photo is eyewash for the no nothings in the world. Michelle is kind to the retards.